I have discussed elsewhere the stings administered by the Wasps to their prey. Now chemistry comes and puts a spoke in the wheel of our arguments, telling us that the poison of the Bees is not the same as that of the Wasps. 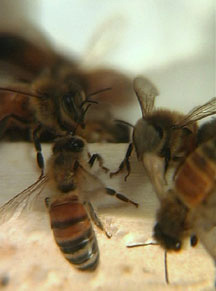 The Bees' is complex and formed of two elements, acid and alkaline. The Wasps' possess only the acid element; and it is to this very acidity and not to the ‚so-called‘ skill of the operators that the preservation of the provisions is due (1). Admitting that there is a difference in the nature of the venom, I fail to see that this has any bearing on the problem in hand. I can inoculate with various liquids — acids, weak nitric acid, alkalis, ammonia, neutral bodies, spirits of wine, essence of turpentine — and obtain conditions similar to those of the victims of the predatory insects, that is to say, inertia with the persistence of a dull vitality betrayed by the movements of the mouth-parts and antennae. I am not, of course, invariably successful, for there is neither delicacy nor precision in my poisoned needle and the wound which it makes does not bear comparison with the tiny puncture of the unerring natural sting; but, after all, it is repeated often enough to put the object of my experiment beyond doubt. I should add that, to achieve success, we must have a subject with a concentrated ganglionic column, such as the Weevil, the Buprestis, the Dung-beetle and others. Paralysis is then obtained with but a single prick, made at the point which the Cerceris has revealed to us, the point at which the corselet joins the rest of the thorax. In that case, the least possible quantity of the acrid liquid is instilled, a quantity too small to endanger the patient's life. With scattered nervous centres, each requiring a separate operation, this method is impracticable: the victim would die of the excess of corrosive fluid. I am quite ashamed to have to recall these old experiments. Had they been resumed and carried on by others of greater authority than I, we should have escaped the objections of chemistry. Acting, therefore, under the instruction of that one guide, pain, I place the Bee's sting far above that of the predatory insects as an offensive weapon. A single one of its thrusts must equal and often surpass in efficaciousness the repeated wounds of the other. For all these reasons — an excessive display of energy; the variable quantity of the virus inoculated by a wriggling abdomen which no longer measures the emission by doses; a sting which I cannot direct as I please; a wound which may be deep or superficial, the weapon entering perpendicularly or obliquely, touching the nerve-centres or affecting only the surrounding tissues — my experiments ought to produce the most varied results. I will suppose a precursor of the Calicurgi (The Calicurgus, or Pompilus, is a Hunting Wasp, feeding her larvae on Spiders. Cf. „The Life and Love of the Insect“: chapter 12. (10) dwelling in the prehistoric coal-forests. Her prey was some hideous Scorpion, that first-born of the Arachnida. How did the Hymenopteron master the terrible prey? Analogy tells us, by the methods of the present slayer of Tarantulae. It disarmed the adversary; it paralysed the venomous sting by a stroke administered at a point which we could determine for certain by the animal's anatomy. Unless this was the way it happened, the assailant must have perished, first stabbed and then devoured by the prey. There is no getting away from it: either the precursor of the Calicurgi, that slaughterer of Scorpions, knew her trade thoroughly, or else the continuation of her race became impossible, even as it would be impossible to keep up the race of the Tarantula-killer without the dagger-thrust that paralyses the Spider's poison-fangs. The first who, greatly daring, pinked the Scorpion of the coal-seams was already an expert fencer; the first to come to grips with the Tarantula had an unerring knowledge of her dangerous surgery. The least hesitation, the slightest speculation; and they were lost. The first teacher would also have been the last, with no disciples to take up her work and perfect it. Besides, push on the pitiful argument. One leads to two, two lead to three. Granted without dispute. And then? We will accept the Scolia as the pioneer, the foundress of the first principles of the art. The simplicity of her method justifies our supposition. She learns her trade in some way or other, by accident; she knows supremely well how to paralyse her Cetonia-grub with a single dagger-thrust driven into the thorax. One day, through some fortuitous circumstance, or rather by mistake, she takes it into her head to strike two blows. As one is enough for the Cetonia, the repetition was of no value unless there was a change of prey. What was the new victim submitted to the butcher's knife? Apparently, a large Spider, since the Tarantula and the Garden Spider call for two thrusts. And the prentice Scolia, who used at first to sting under the throat, had the skill, at her first attempt, to begin by disarming her adversary and then to go quite low down, almost to the end of the thorax, to strike the vital point. I am utterly incredulous as to her success. I see her eaten up if her lancet swerves and hits the wrong spot. Let us look impossibility boldly in the face and admit that she succeeds. I then see the offspring, which have no recollection of the fortunate event save through the belly — and then we are postulating that the digestion of the carnivorous larva leaves a trace in the memory of the honey-sipping insect — I see the offspring, I say, obliged to wait at long intervals for that inspired double thrust and obliged to succeed each time under pain of death for them and their descendants. To accept this host of impossibilities exceeds all my faculties of belief. One leads to two, no doubt; the Ssingle blow of the predatory Wasp will never lead to the blow twice delivered. 2. The author's numerous essays on the Wasps will form the contents of later works. In the meantime, cf. „Insect Life,“ by J.H. Fabre, translated by the author of „Mademoiselle Mori“: chapters 4 to 12, and 14 to 18; and „The Life and Love of the Insect,“ by J. Henri Fabre, translated by Alexander Teixeira de Mattos: chapters 11, 12 and 17. 3. This Decticus has received its specific name of verrucivorus, or Wart-eating, because it is employed by the peasants in Sweden and elsewhere to bite off the warts on their fingers. 4. A species of Green Grasshopper. The Sphex paralyses Crickets and Grasshoppers to provide food for her grubs. Cf. „Insect Life“: chapters 6 to 12. 5. An order of insects including the Grasshoppers, Locusts, Cockroaches, Mantes and Earwigs, in addition to the Stick- and Leaf-insects, Termites, Dragon-flies, May-flies, Book-lice and others. 6. Caterpillars are the prey of the Ammophila, which administers a separate stab to each of the several ganglia. 7. This is the usual mode of progression of the Cetonia- or Rosechafer-grub. Cf. „The Life and Love of the Insect“: chapter 11. 8. Mantis religiosa, so-called because the toothed fore-legs, in which it catches and kills its prey, adopt, when folded, an attitude resembling that of prayer. 10. Cf. „Insect Life“: chapter 10. Hence the French expression, une verite de La Palice, meaning an obvious truth.